Starting at the south end of the levee district, running north the whole length of the district with branches opening to Irving, to Wichita Falls, and to Denton and Gainesville, Industrial Boulevard, 130 feet wide, was dedicated for future traffic use at a time when there was no traffic at all. Such is progress! In less than twenty years this intersection was reported to be the busiest intersection of vehicle traffic in the state. Planning, hard work, and faith bring wonders to pass. 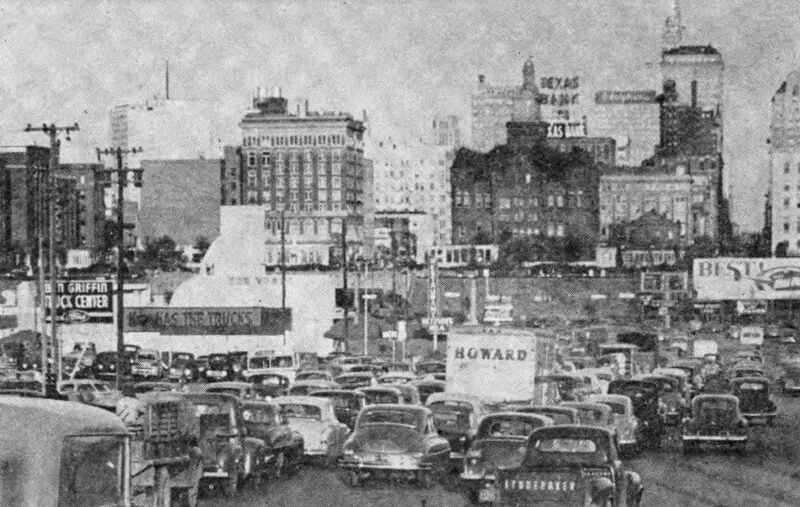 Photo and text from Justin A. Kimball’s Our City –Dallas; Yesterday and Tomorrow (Dallas: Dallas Independent School District, 1954 — 2nd edition). More on Leslie A. Stemmons here. And an article from the months preceding the name-change from Industrial to Riverfront, here. And if you, like I, wondered if “Mr. Upthegrove” was some sort of contrived Pythonesque name a la “Mr. Smoketoomuch,” it is, apparently, an actual surname. Good to know.